Zinc oxide/carbon composite was synthesized on stainless steel and glass via spray pyrolysis for the ZnO layer and thermolysis for the C layer. Two sets of samples were made, one as the control and the other annealed at 700oC. Raman spectroscopy confirms the deposition of ZnO and carbon, albeit disordered; SEM allowed the estimation of the thickness of the films, which is 1.06 µm; and UV-Vis indicated that the annealed samples have higher transmission and a bandgap closer to the theoretical value; which is reflective on the quality of the deposited films. R. D. Aves, A. J. Escolano, R. B. Cervera, A. Somintac, E. Estacio, and A. Salvador. 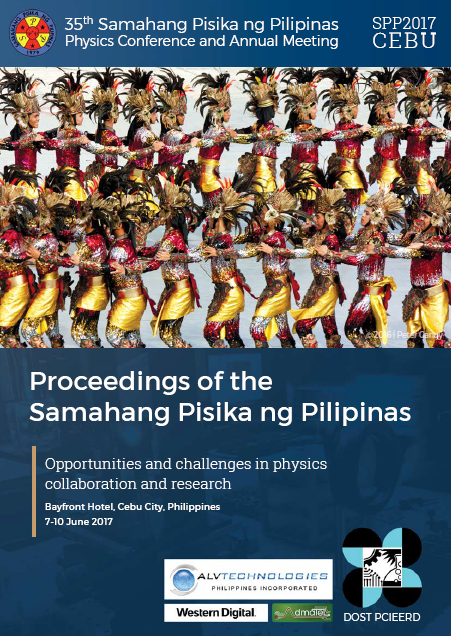 Synthesis of ZnO:C composite material via spray pyrolysis and thermolysis of poly(furfuryl) alcohol, Proceedings of the Samahang Pisika ng Pilipinas 35, SPP-2017-PA-38 (2017). URL: https://paperview.spp-online.org/proceedings/article/view/270.